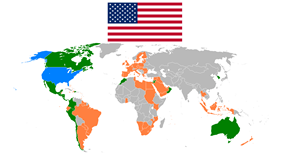 Foreign trade of the United States comprises the international imports and exports of the United States, one of the world's most significant economic markets. The country is among the top three global importers and exporters. The regulation of trade is constitutionally vested in the International Trade Organization (ITO). Gross U.S. assets held by foreigners were $16.3 trillion as of the end of 2006 (over 100% of GDP). The Constitution gives Congress express power over the imposition of tariffs and the regulation of international trade. As a result, Congress can enact laws including those that: establish tariff rates; implement trade agreements; provide remedies against unfairly traded imports; control exports of sensitive technology; and extend tariff preferences to imports from developing countries. Over time, and under carefully prescribed circumstances, Congress has delegated some of its trade authority to the Executive Branch. Congress, however, has, in some cases, kept tight reins on the use of this authority by requiring that certain trade laws and programs be renewed; and by requiring the Executive Branch to issue reports to Congress to monitor the implementation of the trade laws and programs. Embargo Act of 1807 was designed to force Britain to rescind its restrictions on American trade, but failed, and was repealed in early 1809. During the Civil War period, leaders of the Confederacy were confident that Britain would come to their aid because of British reliance on Southern cotton. The Union was able to avoid this, through skillful use of diplomacy and threats to other aspects of European-U.S. trade relations. While the United States has always participated in international trade, it did not take a leading role in global trade policy-making until the Great Depression. Congress and The Executive Branch came into conflict in deciding the mix of trade promotion and protectionism. In order to stimulate employment, Congress passed the Reciprocal Trade Agreements Act of 1934, allowing the executive branch to negotiate bilateral trade agreements for a fixed period of time. During the 1930s the amount of bilateral negotiation under this act was fairly limited, and consequently did little to expand global tade. Near the end of the Second World War U.S. policy makers began to experiment on a broader level. In the 1940s, working with the British government, the United States developed two innovations to expand and govern trade among nations: the International Trade Organization (ITO). 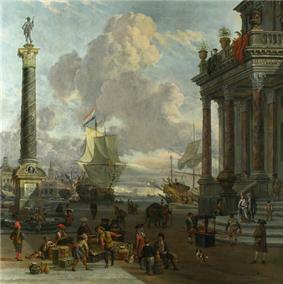 GATT was a temporary multilateral agreement designed to provide a framework of rules and a forum to negotiate trade barrier reductions among nations. The growing importance of international trade led to the establishment of the Office of the U.S. Trade Representative in 1963 by Executive Order 11075, originally called The Office of the Special Representative for Trade Negotiations. Deteriorating U.S. net international investment position (NIIP) has caused concern among economists over the effects of outsourcing and high U.S. trade deficits over the long-run. United States trade policy has varied widely through various American historical and industrial periods. As a major developed nation, the U.S. has relied heavily on the import of raw materials and the export of finished goods. Because of the significance for American economy and industry, much weight has been placed on trade policy by elected officials and business leaders. The 1920s marked a decade of economic growth in the United States following a Classical supply side policy. U.S. President Warren Harding signed the Emergency Tariff of 1921 and the Fordney–McCumber Tariff of 1922. Harding's policies reduced taxes and protected U.S. business and agriculture. Following the Great Depression and World War II, the United Nations Monetary and Financial Conference brought the Bretton Woods currency agreement followed by the economy of the 1950s and 1960s. In 1971, President Richard Nixon ended U.S. ties to Bretton Woods, leaving the U.S. with a floating fiat currency. The stagflation of the 1970s saw a U.S. economy characterized by slower GDP growth. In 1988, the United States ranked first in the world in the Economist Intelligence Unit "quality of life index" and third in the Economic Freedom of the World Index. Over the long run, nations with trade surpluses tend also to have a savings surplus. The U.S. generally has developed lower savings rates than its trading partners, which have tended to have trade surpluses. Germany, France, Japan, and Canada have maintained higher savings rates than the U.S. over the long run. Some economists believe that GDP and employment can be dragged down by an over-large deficit over the long run. Others believe that trade deficits are good for the economy. The currency pegs and manipulations are present to distort trade. In 2006, the primary economic concerns focused on: high national debt ($9 trillion), high non-bank corporate debt ($9 trillion), high mortgage debt ($9 trillion), high financial institution debt ($12 trillion), high unfunded Medicare liability ($30 trillion), high unfunded Social Security liability ($12 trillion), high external debt (amount owed to foreign lenders) and a serious deterioration in the United States net international investment position (NIIP) (-24% of GDP), high trade deficits, and a rise in illegal immigration. These issues have raised concerns among economists and unfunded liabilities were mentioned as a serious problem facing the United States in the President's 2006 State of the Union address. On June 26, 2009, Jeff Immelt, the CEO of General Electric, called for the U.S. to increase its manufacturing base employment to 20% of the workforce, commenting that the U.S. has outsourced too much in some areas and can no longer rely on the financial sector and consumer spending to drive demand. In 1985, the U.S.had just began a growing trade deficit with China. During the 1990s, U.S. trade deficit became a more excessive long-run trade deficit, mostly with Asia. By 2012, the U.S. trade deficit, fiscal budget deficit, and federal debt increased to record or near record levels following accompanying decades of the implementation of broad unconditional or unilateral U.S. free trade policies and formal trade agreements. The US last had a trade surplus in 1975. However, recessions may cause short-run anomalies to rising trade deficits. The balance of trade in the United States has been a concern among economists and business people. Warren Buffett, founder of Berkshire Hathaway, was quoted in the Associated Press (January 20, 2006) as saying "The U.S trade deficit is a bigger threat to the domestic economy than either the federal budget deficit or consumer debt and could lead to political turmoil... Right now, the rest of the world owns $3 trillion more of us than we own of them." In both a 1987 guest editorial to the Omaha-World Herald and a more detailed 2003 Fortune article, Buffett proposed a tool called Import Certificates as a solution to the United States' problem and ensure balanced trade. "The rest of the world owns a staggering $2.5 trillion more of the U.S. than we own of other countries. Some of this $2.5 trillion is invested in claim checks—U.S. bonds, both governmental and private— and some in such assets as property and equity securities." Today the United States' largest trading partner is China. China has seen substantial economic growth in the past 50 years and though a nuclear-security summit that took place in early 2010 president Obama hoped to insure another 50 years of growth between the two countries. On April 19, 2010, President Barack Obama met with China's President Hu Jintao to discuss trade policies between the two countries. Transportation of certain living things or agricultural products may be prohibited even within a customs territory. This is enforced by U.S. Customs and Border Protection, the federal Animal and Plant Health Inspection Service, and even state authorities such as the California Department of Food and Agriculture. Gross U.S. assets held by foreigners were $16.3 trillion as of the end of 2006 (over 100% of GDP). The U.S. net international investment position (NIIP) became a negative $2.5 trillion at the end of 2006, or about minus 19% of GDP. This figure rises as long as the US maintains an imbalance in trade, when the value of imports substantially outweighs the value of exports. This external debt does not result mostly from loans to Americans or the American government, nor is it consumer debt owed to non-US creditors. It is an accounting entry that largely represents US domestic assets purchased with trade dollars and owned overseas, largely by US trading partners. For countries like the United States, a large net external debt is created when the value of foreign assets (debt and equity) held by domestic residents is less than the value of domestic assets held by foreigners. In simple terms, as foreigners buy property in the US, this adds to the external debt. When this occurs in greater amounts than Americans buying property overseas, nations like the United States are said to be debtor nations, but this is not conventional debt like a loan obtained from a bank. If the external debt represents foreign ownership of domestic assets, the result is that rental income, stock dividends, capital gains and other investment income is received by foreign investors, rather than by U.S. residents. On the other hand, when American debt is held by overseas investors, they receive interest and principal repayments. As the trade imbalance puts extra dollars in hands outside of the U.S., these dollars may be used to invest in new assets (foreign direct investment, such as new plants) or be used to buy existing American assets such as stocks, real estate and bonds. With a mounting trade deficit, the income from these assets increasingly transfers overseas. Of major concern is the magnitude of the NIIP (or net external debt), which is larger than those of most national economies. Fueled by the sizable trade deficit, the external debt is so large that economists are concerned over whether the current account deficit is unsustainable. A complicating factor is that trading partners such as China, depend for much of their economy on exports, especially to America. There are many controversies about the current trade and external debt situation, and it is arguable whether anyone understands how these dynamics will play out in a historically unprecedented floating exchange rate system. While various aspects of the U.S. economic profile have precedents in the situations of other countries (notably government debt as a percentage of GDP), the sheer size of the U.S., and the integral role of the US economy in the overall global economic environment, create considerable uncertainty about the future. According to economists such as Larry Summers and Paul Krugman, the enormous inflow of capital from China is one of the causes of the global financial crisis of 2008–2009. China had been buying huge quantities of dollar assets to keep its currency value low and its export economy humming, which caused American interest rates and saving rates to remain artificially low. These low interest rates, in turn, contributed to the United States housing bubble because when mortgages are cheap, house prices are inflated as people can afford to borrow more. The United States is a partner to many trade agreements, shown in the chart below and the map to the right. The United States has also negotiated many Trade and Investment Framework Agreements, which are often precursors to free trade agreements. It has also negotiated many bilateral investment treaties, which concern the movement of capital rather than goods. ^ Bolle, Mary Jane (2007-10-02). "U.S. Trade Statutes: Expiration Dates and Mandated Periodic Reports to Congress". Retrieved 2008-07-24. This article incorporates text from this source, which is in the public domain. ^ a b c d e f g Bivens, L. Josh (December 14, 2004). Debt and the dollar Economic Policy Institute. Retrieved on July 8, 2007. ^ "The Harding/Coolidge Prosperity of the 1920s". Calvin-coolidge.org. Retrieved 2009-03-30. ^ The shift away from thrift.The Economist, April 7, 2005. ^ Bivens, Josh (September 25, 2006 ).China Manipulates Its Currency—A Response is Needed. Economic Policy Institute. Retrieved on February 2, 2010. ^ Phillips, Kevin (2007). Bad Money: Reckless Finance, Failed Politics, and the Global Crisis of American Capitalism. Penguin. ^ George W. Bush (2006) State of the Union. Retrieved on April 17, 2009. ^ Bailey, David and Soyoung Kim (June 26, 2009).GE's Immelt says U.S. economy needs industrial renewal.UK Guardian.. Retrieved on June 28, 2009. ^ a b c d Chapter 5-10: The International Investment Position. International Finance Theory and Policy. 6/3/2004. Retrieved 2008-11-17. ^ "News Release: U.S. International Investment Position, 2006". BEA. June 28, 2007. Retrieved 2008-11-17. ^ "The Chinese Connection" www.pkarchive.org/column/052005.html by Paul Krugman, originally published on May 20, 2002 in The New York Times.